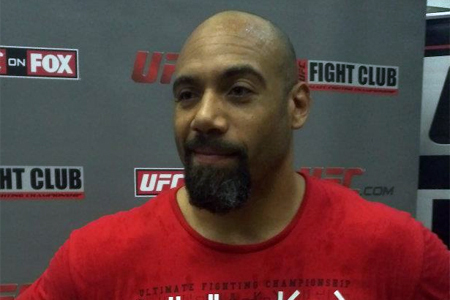 Despite dropping his second straight big league bout, Lavar Johnson (pictured) will not be released from the UFC. Needless to say, the heavyweight was more than thrilled he wasn’t issued his walking papers. “Thank God, I still have a job with the ufc!” Johnson tweeted Thursday night. The slugger started out his Octagon career with a bang by winning his first two fights in knockout fashion. However, Johnson followed up those highlight reel performances with a first round submission loss to Stefan Struve and last weekend’s unanimous decision defeat to Brendan Schaub. Schaub thoroughly exposed the kickboxer’s struggling ground game. Now that Johnson has been granted a reprieve, best believe he’ll look to fine tune his grappling skills. The lack of depth the UFC has in their heavyweight division likely played a key factor in their decision to keep Johnson. Furthermore, the last couple of times the 35-year-old went on a two fight skid, he subsequently rattled off seven and two straight wins, respectively. Johnson owns a 17-7 professional record overall.